The ‘70 years of culinary excellence’ promotion is available in restaurants at all Mövenpick properties globally, including Mövenpick Hotel Mactan Island Cebu in the Philippines, from March 10 to April 20, 2018. 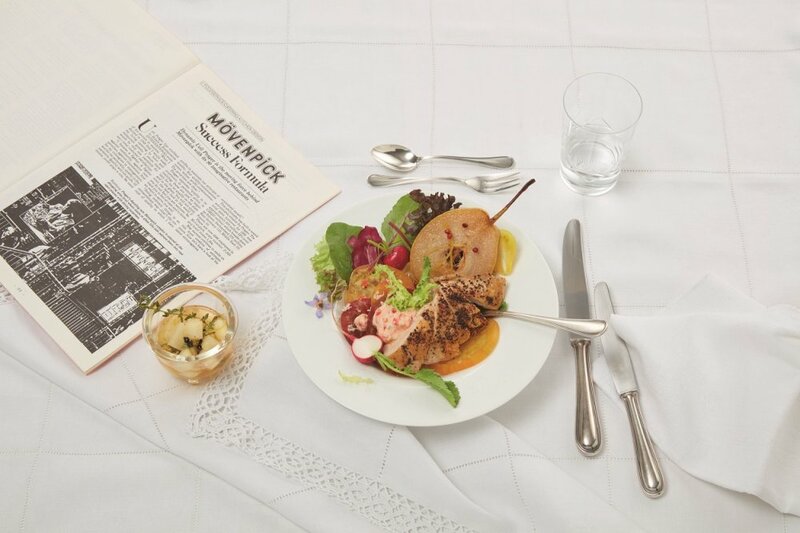 This introduces seven inventive dishes that pay tribute to Ueli Prager, who when founding the Mövenpick brand in 1948, redefined the European restaurant scene and paved the way for a new style of modern hospitality, based on a simple premise: ‘doing normal things in an extraordinary manner’. Just as Prager introduced diners to unpretentious cuisine with a twist, such as curry-based Riz Casimir – a first in Europe –so 70 years on,Mövenpick chefs have created an inspiring menu of uncomplicated but surprising creations, all of which use fresh, authentic and health-promoting ingredients. They include:Scallops & avocado tartare -a reinvention of Mövenpick’s popular beef tartare, influenced by Mediterranean cuisine; salade belle fermière -a lively interpretation of Salade François, made famous in the 1948 American musical film, “Easter Parade”; mille feuille saumon & caviar d’olive -a savoury take combining delicate smoked salmon, puff pastry and golden olive caviar; mushrooms and vegetables Zurich style- a meat-free version of Zurich-style veal that pairs aromatic root vegetables and smoky Shitake mushrooms; seafood Casimir - a medley of steamed seafood, fish and salicornia (sea asparagus), and an assortment of citrus fillets, paired with wild rice; bare beef burger Café de Paris– a prime beef cut paired with crispy ultra-thin parmesan-dusted fries; andcarrot waffle -a quirky reinterpretation of classic Swiss carrot cake. As he strolled the shores of Lake Zurich with a friend and considered the possibilities, a seagull (or Möwe in German), swooped down to skillfully pick up food mid-flight. That one elegant movement encapsulated his idea and so ‘Mövenpick’ (Möwe pick) - and Europe’s first casual dining experience - was born. Twenty-five years later, in 1973, Prager capitalized on the brand’s reputation for quality food, affordability, staff training standards and innovation by opening the company’s first two hotels. This marked the official launch of Mövenpick Hotels & Resorts and today, his values penetrate every aspect of Mövenpick Group’s business, including Mövenpick Gastronomy, Mövenpick Wine, and Mövenpick Fine Foods. Experience this special limited offer when you visit Mövenpick Hotel Mactan Island Cebu. For more details, emailhotel.cebu@movenpick.com or call +63 32 492 7777.